1. There is something about getting the sound out of a piano without having to move a slider or turn a knob. As the pianist, you control that as you press the key. It's also pretty cool to feel the slight buzz in your fingertips from touching the keys. 2. The sound from the piano is the main thing for me. It's an awesome phenomenon to hear the overtones on a piano. It's like the tones are alive and blending with each other. 3. The action on a piano to me is more exact. What I mean by that is there once you press the key, the tone is released. The issue of latency is not present when playing an acoustic piano. There is no delay. 4. For me, playing on an acoustic piano keeps me honest. I cannot afford to be lazy while I am on a piano. I am accountable for every tone that comes out. I have total control of that. 5. The connection to an acoustic piano is wonderful. I feel that the piano is an extension of me. I am sending out the raw, unfiltered sound and emotion when I am playing. 6. I also believe that the acoustic sound has a deeper effect on people rather than the digital sound. It is probably because of the pure overtones and the pure vibrations on the acoustic piano. There are many more reasons that I have missed. I love the piano. I'm not knocking that how far the digital world has come. This is just a matter of preference. I have been playing pianos since I was a child (I had a Baldwin upright for many years. We pretty much grew up together.) Please feel free to chime in! Thanks for taking the time to read this! P.S. 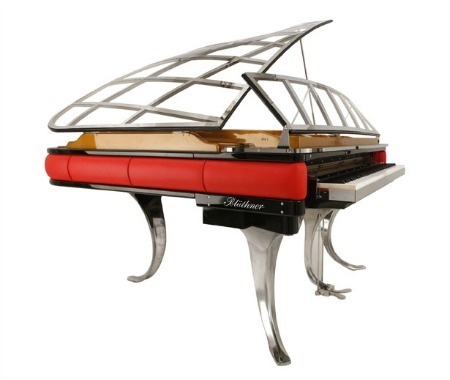 I will do a blog on my favorite digital/virtual pianos.